Our Maestro spoke during yesterday’s Falstaff rehearsal of finding joy. Specifically, when something isn’t seriously harmful and you can live with it, attempt to turn the experience into one of joy. To me, this is so much more appealing than the old saying, “that which won’t kill you will make you stronger”. Today I had a window of time to go for a bike ride, thanks to Baby A’s grandparents. I was so excited to get on my newly tuned-up Supersix and ride somewhere other than to and from work! The 15th avenue climb into the Presidio felt so easy and I immediately attributed it to my bike. Then I remembered that since there’s no granny gear climbing should be harder than on my Bianchi and I thought maybe, just maybe the ease had to do with my legs getting stronger. My bike commute is short but regular with a climb on the way home that I often do with violin on my back, toting clothes and food (and farmers market treasures yesterday!). 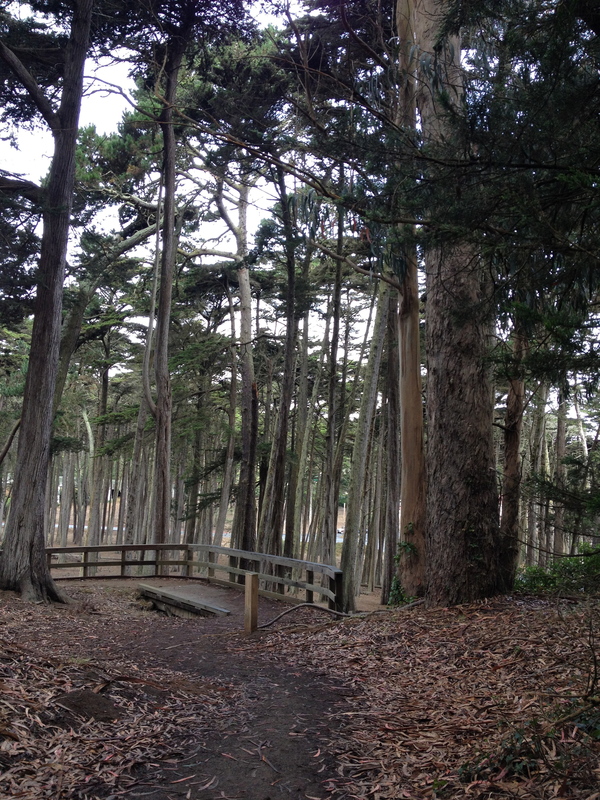 Reaching the top of the hill, I zipped through the Presidio and came to a screeching halt as I approached the bridge. There were school groups and tourists galore enjoying a fabulous sunny morning and a stunning view. Argh. Why in the world can’t they leave the biking side of the bridge open during the day?! I practiced my balance as I slowed and stopped without unclipping several times, but eventually made it to the other side. Then it was up, up, up the Headlands. I was immediately humbled by the first steep portion and it was through my grimace that I remembered the quote about finding joy. Hurting on a bike ride is hardly life-threatening so it was simple for me to take a deep breath and smile out at the sparkling blue expanse of Pacific Ocean. A Headlands climb never felt easier and I reached the top in record time. I stopped for several minutes to appreciate the beauty at my feet and chatted with another triumphant cyclist. Back at the bridge, I heard a cyclist coming off the expanse exclaim “That’s always a _#_*%_ adventure!” An adventure is what we call it, huh? I remember the adventure when somebody stepped in front of me and didn’t hear me yelling and even though I was moving at a snail’s pace I still ran into her then couldn’t unclip my right foot fast enough and fell into the person next to me. Somehow her white pants didn’t catch any bike grease. That was embarrassing. And there was the other adventure when the guard rail was too low on the west side of the bridge and one cyclist decided to pass another who was already passing a third. They collided and first guy flipped, ending up on his head in oncoming bridge traffic. By some miracle, traffic was moving slowly that day and he wasn’t hurt. I’ll save my adventures for somewhere else, thank you! Now that I’ve taken the leap back into cycling with a double Headlands climb, I think I’ll make an effort to do it more often. I’ve got about a dozen babysitters on speed dial so I can no longer use the “I have a baby” excuse. Who wants to join me? This evening at the gym I sat Baby A on the counter in the women’s locker room so I could clean his hands. A woman walked up to the sink next to us, towel wrapped around her lower half. Baby A studied her for a moment, then with a huge grin offered a loud “HI!” The woman was startled and made some comment about how he seemed to be having too much fun and maybe he should be in the men’s locker room. Later, in spinning class I was composing yet another blog entry in my head that would probably not be posted (as is my habit lately) and realized that I stopped writing shortly after my long run two weeks ago that re-injured my foot. Truth be told, my foot wasn’t in mint condition before and I probably shouldn’t have been running so far but I was blindly chasing the half marathon I’d signed up for in November, sure that if I could just add a mile a week I would be ready. That Tuesday’s run was really just an accident to begin with. The day before our conductor told us he’d start rehearsal half hour later the following morning and my babysitter was already booked, so with two hours of time to myself I decided to run a 7 mile ark around the city and end up at work. The run itself was completely wonderful, scenic and wet through the Presidio, America’s Cup madness along Crissy Field then out at Van Ness, chasing the 47 bus all the way to the opera house. My route ended up being just shy of 8 miles and my foot didn’t hurt until I stood up during my first rehearsal break. Then I knew I was in trouble. I haven’t run since and I’m really missing it. It occurred to me today that Baby A is also out of the habit of sitting in the stroller while I run so he may not be agreeable to getting started again, whenever that may be. I am still planning on completing See Jane Tri in less than two weeks and I’m not sure if I’ll run before then or just continue letting my foot heal. My fastest marathon to date was preceded by two weeks of sickness (rest). Of course, I was really well trained before I got sick that time. When my husband walks into the kitchen and sees a stick of butter sitting on the counter he knows I’m making him chocolate chip cookies. 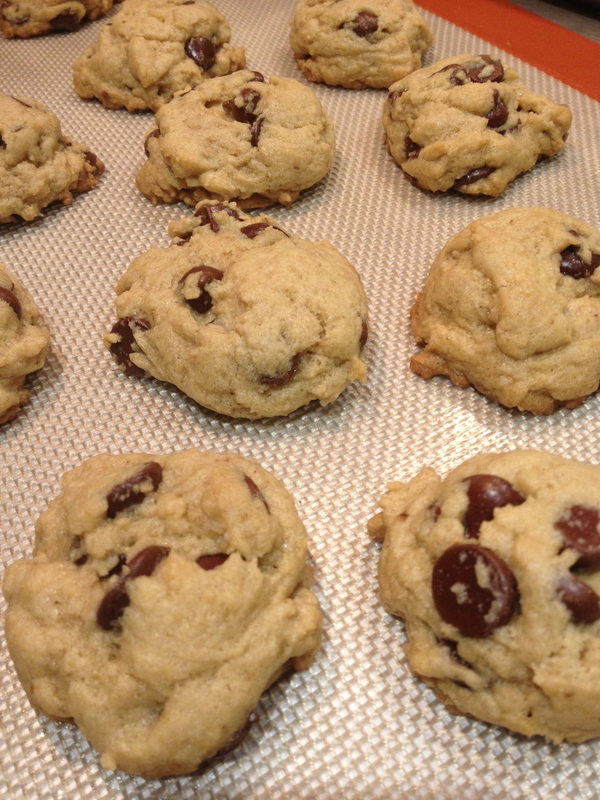 He jokes (or maybe I only think he’s joking) that one of the reasons he married me is I make cookies on demand. Tonight I ate half the dough before putting the cookies into the oven and it was super delicious! Generally after a good workout and a healthy meal I don’t crave sweets as much but tonight seemed to be an exception. This evening I signed Baby A into child-watch at 5pm and ran a mile before spin class. It’s supposed to be a 45 minute class but we only did 35 minutes of actual (very hard) work so I was free to run another half mile before my hour of childcare was up. I pushed myself in the bike class so I would reach 12 miles and took it easy on the runs. I came out sweaty and exhausted, wondering why in the world anyone would choose to do a duathlon (run-bike-run) instead of a triathlon. My pool opens again tomorrow! My sister left me a hilarious message today. She called to share her thought process on the triathlon we’re doing together next month. It had to do with not knowing what to wear for the race and thinking she should check with me about this. Then it dawned on her that maybe she should also train for the race. So she called me to check on that too. Just last night I’d been gazing at some photos of myself crossing the finish line of the Vineman years ago and thinking that maybe I should get something new to wear for See Jane Tri. My thoughts were based in vanity, hers in practicality. What came out of our conversation is that we’ve both started training- or at least preparing- for the race. She’s doing a regular boot camp which gives her gym access so she rode 10 miles on an exercise bike and followed it with a 3 mile run. I ran 6 miles pushing Baby A in his Bob. He was antsy for most of the run so we stopped to say hi to the buffalo, checked out the turtles piled on a rock in the green pond (he wow’d appropriately when I pointed them out), watched a crane and some construction men removing tree branches, practiced the C! D! song (which now finally begins with an A & B ) and sang “Sheena”. It took me over a week to figure out what “sheena” meant but I finally realized that he was saying “clean up”. I sing the clean-up song to him all the time and now he sings it regularly as well- usually while taking books off the shelf or knocking block towers over. Along with the running in small bits that I’ve been doing, my preparations for the race are as follows: crossing my fingers that the swim will be fine (my pool has been closed for 2 weeks but I did manage to swim in our aunt & uncle’s 10 meter backyard pool last weekend- back and forth for 1/2 hour meant tons of flip turn practice!) and reasoning that if I’m commuting 6 miles each day on my not-as-fast bike I should have no trouble at all riding the necessary 12 miles on my fast bike. The rest I’ll leave up to adrenaline and sheer willpower. My husband is Jewish. I’m not. Our son will grow up speaking Hebrew and English and my muddled version of Hebrew. He will learn the Jewish traditions and be immersed in the culture. He will know Hanukkah as well as Christmas. Tonight he will dip his first apple in honey as we celebrate the Jewish new year. He loves dipping so for now this is what Rosh Hashanah will mean to him. For me it’s a chance at another New Year. An opportunity to reflect on the past year and think about how I will chose to live the coming year. I am on a constant quest to live in the moment and be more accepting of myself & others. My son reminds me to live in the present. 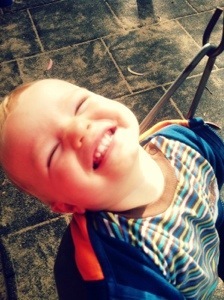 How can I be anywhere else when his beautiful smiling face is exuding pure joy? My own mistakes remind me to go easier on everyone. This morning, for example, I realized that the New Years photo card I sent out has a misspelled word in the single line of hebrew. Ugh… I’m always getting T’s & S’s confused on my keyboard. Beside being embarrassed that this card was sent to all of my husband’s hebrew speaking relatives, I was annoyed that he didn’t catch it while proof-reading. This brought up another now-hilarious major mistake. A few years back we were on a plane full of jews heading to New York for Passover. Making polite conversation, I asked the guy next to me where he’d be spending the third Seder. There are only two Seders. Oops. How does this all translate to workouts? It means that when I miss a run, I’ll try to not allow myself to be in a bad mood later since I skipped a workout. It means that when I’m biking to work and a car/other biker does something I consider stupid, instead of yelling something or thinking mean thoughts for the rest of my ride I’ll try to let it go quickly. It means that when I’m in the middle of a difficult workout I’ll try to embrace the moment instead of praying for it to be over. Wish me luck! And Shana Tova… may your year be sweet and good.